1. Take a measuring tape, a pair of jeans that fit you well, a piece of paper and a pen. 2. 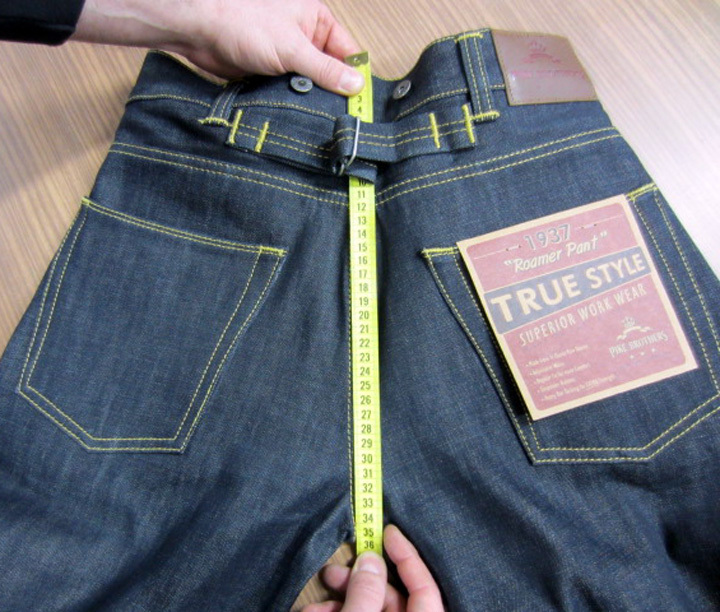 Lay the jeans on a flat surface and start measuring as shown in the pictures. Write down the measurements on the piece of paper. 3. The final step is to compare your measurements with the ones in our size charts, that you find for each garment in our webshop at http://www.pikebrothers.net/shop/ and choose the corresponding size. Done! For measuring the width make sure the front and back are at exactly the same height. For the front and back rises measure from the top including the waist band down to the fold of the fabric (where the two pieces of fabric meet). The last measurement you need is the bottom hem. 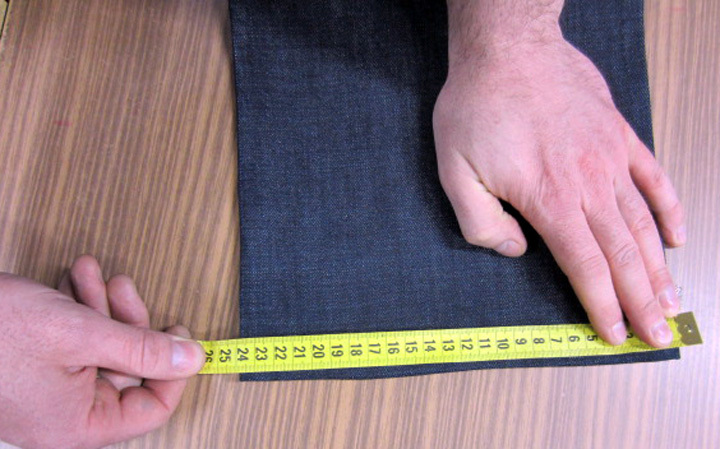 You don’t need to measure the length of the inseam (leg length) as it is a standard size. Hi, I’m tall 190 cm. I need 36/38 leg lenght: is it possibile? thank you for your message! Our 1937 Roamer Pant is usually available in size 36/38, though this size is sold out at the moment, but will be getting a restock in February! thank you very much for your message. 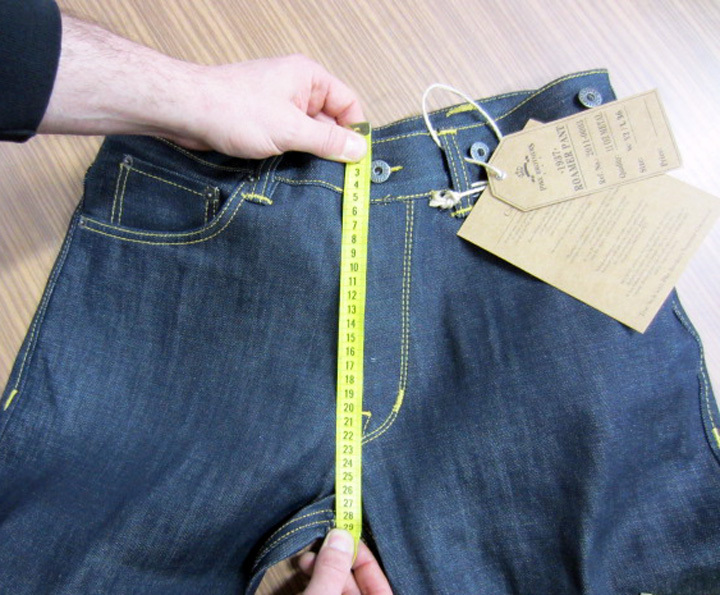 The thigh measurements was taken at the point where the seems meet in the crotch area and measured across the thigh. The measurement is about 30,5 cm for both sizes. Do you have any Ladies’ jeans? I see you have the Roamer in waist 27″ but I have no jeans to measure. I only have high waisted jeans. My natural waist is 26/27″. Which jeans would you recommend and can I go with your size 27? Hey, I am really fond of the 1908 MINER PANT 14OZ HEMP DENIM. But I can not find the size chart of that pant. Usually I wear a size w30 or 31 Levi’s 501 jeans. Can you give me a measurement of the waistline of that or some advices? and the same for the1958 ROAMER PANT 15OZ.